Received August 9, 2018; Revised December 4, 2018; Accepted December 18, 2018. Plants are exposed to biotic stresses caused by pathogen attack and complex abiotic stresses including heat and drought by dynamic climate changes. To alleviate these stresses, we investigated two bacterial stains, H26-2 and H30-3 in two cultivars (‘Ryeokkwang’ and ‘Buram-3-ho’) of Chinese cabbage in plastic pots in a greenhouse. We evaluated effects of bacterial strains on plant growth-promotion and mitigation of heat and drought stresses; the role of exopolysaccharides as one of bacterial determinants on alleviating stresses; biocontrol activity against soft rot caused by Pectobacterium carotovorum subsp. carotovorum PCC21. Strains H26-2 and H30-3 significantly increased fresh weights compared to a MgSO4 solution; reduced leaf wilting and promoted recovery after re-watering under heat and drought stresses. Chinese cabbages treated with H26-2 and H30-3 increased leaf abscisic acid (ABA) content and reduced stomatal opening after stresses treatments, in addition, these strains stably colonized and maintained their populations in rhizosphere during heat and drought stresses. As well as tested bacterial cells, exopolysaccharides (EPS) of H30-3 could be one of bacterial determinants for alleviation of tested stresses in Chinese cabbages, however, the effects were different to cultivars of Chinese cabbages. In addition to bacterial activity to abiotic stresses, H30-3 could suppress incidence (%) of soft rot in ‘Buram-3-ho’. The tested strains were identified as Bacillus aryabhattai H26-2 and B. siamensis H30-3 based on 16S rRNA gene sequence analysis. Taken together, H26-2 and H30-3 could be candidates for both plant growth promotion and mitigation of heat and drought stresses in Chinese cabbage. This work was supported by National Institute of Agricultural Science (Project No. PJ012517) of Rural Development Administration, Republic of Korea. Fig. 1. (A) Growth promotion by Bacillus aryabhattai H26-2 and Bacillus siamensis H30-3 compared to 10 mM MgSO4 solution (control) in Chinese cabbage (‘Ryeokkwang’ and ‘Buram- 3-ho’) under non-stress condition; (B) Leaf wilting score (0–5) under heat and drought conditions; (C) fresh weight after rewatering of Chinese cabbages (‘Ryeokkwang’ and ‘Buram-3-ho’). Plants were treated with bacterial strains H26-2 and H30-3, or 10 mM MgSO4 solution (untreated control), one week later, heat and drought stresses were treated; Twenty-four h after end of stress treatment, fresh weight were assessed. Error bars indicate the standard errors of 20 replications from two experiments. An asterisk on bars with standard errors indicate significant (P < 0.05) differences between treatments according to the least significant difference test. Fig. 2. (A) Abscisic acid (ABA) contents and (B) stomatal opening (%) in leaves of Chinese cabbages (‘Ryeokkwang’ and ‘Buram-3-ho’) at 24 h after heat and drought stresses treatment. Plants were drenched with strain H26-2 and H30-3, and 10mM MgSO4 solution as untreated control, one week later, heat and drought stresses were performed. Error bars indicate the standard errors of eight (for ABA contents) or 16 (for stomatal opening) replications from two experiments. An asterisk on bars with error bars indicate significant (P < 0.05) differences between treatments according to the least significant difference test. Fig. 3. 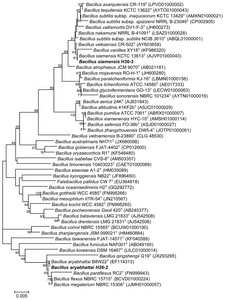 A phylogenetic tree performed by the neighbor-joining method showing the relationship of Bacillus aryabhattai H26-2 and Bacillus siamensis H30-3 with other species of the genus Bacillus based on 16S rRNA sequences analysis. Numbers at the blanching points are the bootstrap values (> 50%) for 1,000 replicates. A scale bar indicates 5 nucleotide substitutions per 1000 nucleotides of the sequence. Strains H26-2 and H30-3 are shown in bold type. T, type strain. bBacterial colonization was determined by counting colony-forming unit (cfu) in pot soils at 1, 3, 5 d after stress treatment on Chinese cabbage plants. cMean ± standard errors with same letters are not significantly different between DAS at each non-stress or stresses in cultivars according to the least significantly difference test at P < 0.05. An asterisk indicates significant difference between non-stress vs. stresses at each DAS according to the t-test. Experiments were conducted twice with four replicates each. aThe numbers of seedlings with open and green leaves after seed germination were recorded at 3 and 4 d after seeding in repeated experiments; number of lateral root was evaluated at 17 d after seeding. Values ± standard errors of each cultivar and treatment in a column followed by same letters are not significantly different according to the least significant difference test at P < 0.05. Experiment were conducted twice with ten replicates each. bPlants were treated with EPS (10 μg/ml) of strains H26-2 and H30-3, and 10 mM MgSO4 solution (control), one week later, heat and drought stress were treated; 24 h after end of stress treatment, leaf wilting score was assessed, and fresh weight after re-watering was assessed. Values ± standard errors of each treatment in a column followed by same letters are not significantly different according to the least significant difference test at P < 0.05. Experiments were conducted twice with eight replicates each. aValues ± standard errors of treatments in a column followed by same letters are not significantly different according to the least significant difference test at P < 0.05. Experiment was conducted twice with three replicates with 15 seedling each. Alami Y, Achouak W, Marol C, and Heulin T. 2000. Rhizosphere soil aggregation and plant growth promotion of sunflowers by an exopolysaccharide-producing Rhizobium sp. strain isolated from sunflower roots. Appl Environ Microbiol 66: 3393-3398. Barnawal D, Bharti N, Maji D, Chanotiya CS, and Kalra A. 2014. ACC deaminase-containing Arthrobacter protophormiae induces NaCl stress tolerance through reduced ACC oxidase activity and ethylene production resulting in improved nodulation and mycorrhization in Pisum sativum. J Plant Physiol 171: 884-894. Barrs HD, and Weatherley PE. 1962. A re-examination of the relative turgidity technique for estimating water deficit in leaves. Aust J Biol Sci 15: 413-428. Bashan Y, and Holguin G. 1997. Azospirillum-plant relationships: environmental and physiological advances. Can J Microbiol 43: 103-121. Belimov AA, Dodd IC, Hontzeas N, Theobald JC, Safronova VI, and Davies WJ. 2009. Rhizosphere bacteria containing 1-aminocyclopropane-1-carboxylate deaminase increase yield of plants grown in drying soil via both local and systemic hormone signalling. New Phytol 181: 413-423. Bresson J, Varoquaux F, Bontpart T, Touraine B, and Vile D. 2013. The PGPR strain Phyllobacterium brassicacearum STM196 induces a reproductive delay and physiological changes that result in improved drought tolerance in Arabidopsis. New Phytol 200: 558-569. Bric JM, Bostock RM, and Silverstone SE. 1991. Rapid in situ assay for indole acetic acid production by bacteria immobilized on a nitrocellulose membrane. Appl Environ Microbiol 57: 535-538. Castric KF, and Castric PA. 1983. Method for rapid detection of cyanogenic bacteria. Appl Environ Microbiol 45: 701-702. Chenu C, and Robersin EB. 1996. Diffusion of glucose in microbial extracellular polysaccharide as affected by water potential. Soil Biol Biochem 28: 877-884. Dimkpa C, Weinand T, and Asch F. 2009. Plant-rhizobacteria interactions alleviate abiotic stress conditions. Plant Cell Environ 32: 1682-1694. Dobra J, Motyka V, Dobrev P, Malbeck J, Prasil IT, Haisel D, Gaudinova A, Havlova M, Gubis J, and Vankova R. 2010. Comparison of hormonal responses to heat, drought and combined stress in tobacco plants with elevated proline content. J Plant Physiol 167: 1360-1370. Ghosh D, Sen S, and Mohapatra S. 2017. Modulation of proline metabolic gene expression in Arabidopsis thaliana under water-stressed conditions by a drought-mitigating Pseudomonas putida strain. Ann Microbiol 67: 655-668. Jung SS, Jeong HH, and Kim KS. 2000. Effects of uniconazole treatment on the growth and flowering of potted Chrysanthemum indicum L. Korean J Hortic Sci Technol 18: 28-32. Lee SH, and Cha JS. 2001. Efficient induction of bacterial soft rot using mineral oil. Phytopathology 91: S53-S54. Levene H. 1960. Robust tests for equality of variances. In: Contributions to prorobability and statistics: Essays in honor of harold hotelling, eds. by I. Olkin, SG. Ghurye, W. Hoeffding, WG. Madow, and HB. Mann , pp. 278-292. Stanford University Press, Stanford, California, USA. Kang S-M, Radhakrishnan R, Khan AL, Kim M-J, Park J-M, Kim B-R, Shin D-H, and Lee I-J. 2014. Gibberellin secreting rhizobacterium, Pseudomonas putida H-2-3 modulates the hormonal and stress physiology of soybean to improve the plant growth under saline and drought conditions. Plant Physiol Biochem 84: 115-124. Kaushal M, and Wani SP. 2016. Plant-growth-promoting rhizobacteria: drought stress alleviators to ameliorate crop production in drylands. Ann Microbiol 66: 35-42. Khandelwal A, and Sindhu SS. 2013. ACC deaminase containing rhizobacteria enhance nodulation and plant growth in clusterbean (Cyamopsis tetragonoloba L.). J Microbiol Res 3: 117-123. Kim C-G, Lee S-M, Jeong H-K, Jang J-K, Kim Y-H, and Lee C-K. 2010. Impacts of climate change on Korean agriculture and its counterstrategies . Korea Rural Economic Institute, Seoul, Korea. 305 pp. Kim H-S, Sang MK, Myung IS, Chun SC, and Kim KD. 2009. Characterization of Bacillus luciferensis strain KJ2C12 from pepper root, a biocontrol agent of Phytophthora blight of pepper. Plant Pathol J 25: 62-69. Kumar A, Kumar A, Devi S, Patil S, Payal C, and Negi S. 2012. Isolation, screening and characterization of bacteria from rhizospheric soils for different plant growth promotion (PGP) activities: an in vitro study. Recent Res Sci Technol 4: 1-5. Milagres AMF, Machuca A, and Napoleão D. 1999. Detection of siderophore production from several fungi and bacteria by a modification of chrome azurol S (CAS) agar plate assay. J Microbiol Methods 37: 1-6. Penrose DM, and Glick BR. 2003. Methods for isolating and characterizing ACC deaminase-containing plant growth-promoting rhizobacteria. Physiol Plant 118: 10-15. Pikovskaya RI. 1948. Mobilization of phosphorus in soil in connection with the vital activity of some microbial species. Microbiology 17: 362-370. Sandhya V, Shaik ZA, Grover M, Reddy G, and Venkateswarlu B. 2009. Alleviation of drought stress effects in sunflower seedlings by the exopolysaccharides producing Pseudomonas putida strain GAP-P45. Biol Fert Soils 46: 17-26. Sang MK, and Kim KD. 2012. The volatile-producing Flavobacterium johnsoniae strain GSE09 shows biocontrol activity against Phytophthora capsici in pepper. J Appl Microbiol 113: 383-398. Sang MK, Jeong J-J, Kim J, and Kim KD. 2018. Growth promotion and root colonization in pepper plants by phosphate-solubilising Chryseobacterium sp. strain ISE14 that suppresses Phytophthora blight. Ann Appl Biol 172: 208-223. Santaella C, Schue M, Berge O, Heulin T, and Achouak W. 2008. The exopolysaccharide of Rhizobium sp. YAS34 is not necessary for biofilm formation on Arabidopsis thaliana and Brassica napus roots but contributes to root colonization. Environ Microbiol 10: 2150-2163. Sherameti I, Tripathi S, Varma A, and Oelmüller R. 2008. The root-colonizing endophyte Pirifomospora indica confers drought tolerance in Arabidopsis by stimulating the expression of drought stress–related genes in leaves. Mol Plant-Microbe Interact 21: 799-807. Singh RP, and Jha PN. 2016. The Multifarious PGPR Serratia marcescens CDP-13 augments induced systemic resistance and enhanced salinity tolerance of wheat (Triticum aestivum. L.). PLoS One 11: e0155026. Tallgren AH, Airaksinen U, Von Weissenberg R, Ojamo H, Kuusisto J, and Leisola M. 1999. Exopolysaccharide-producing bacteria from sugar beets. Appl Environ Microbiol 65: 862-864. Timmusk S, Abd El-Daim IA, Copolovici L, Tanilas T, Kännaste A, Behers L, Nevo E, Seisenbaeva G, Stenström E, and Niinemets Ü. 2014. Drought-tolerance of wheat improved by rhizosphere bacteria from harsh environments: enhanced biomass production and reduced emissions of stress volatiles. PLoS One 9: e96086. Tiwari S, Prasad V, Chauhan PS, and Lata C. 2017. Bacillus amyloliquefaciens confers tolerance to various abiotic stresses and modulates plant response to phytohormones through osmoprotection and gene expression regulation in rice. Front Plant Sci 8: 1510. Vurukonda SS, Vardharajula S, Shrivastava M, and Shaik ZA. 2016. Enhancement of drought stress tolerance in crops by plant growth promoting rhizobacteria. Microbiol Res 184: 13-24. Weisburg WG, Barns SM, Pelletier DA, and Lane DJ. 1991. 16S ribosomal DNA amplification for phylogenetic study. J Bacteriol 173: 697-703. Yang J, Kloepper JW, and Ryu CM. 2009. Rhizosphere bacteria help plants tolerate abiotic stress. Trends Plant Sci 14: 1-4. Yoon SH, Ha SM, Kwon S, Lim J, Kim Y, Seo H, and Chun J. 2017. Introducing EzBioCloud: A taxonomically united database of 16S rRNA and whole genome assemblies. Int J Syst Evol Microbiol 67: 1613-1617. Zhang H, Mao X, Wang C, and Jing R. 2010. Overexpression of a common wheat gene TaSnRK2.8 enhances tolerance to drought, salt and low temperature in Arabidopsis. PLoS One 5: e16041. Zhang J, Jia W, Yang J, and Ismail AM. 2006. Role of ABA in integrating plant responses to drought and salt stresses. Field Crops Res 97: 111-119. Zhu J-K. 2002. Salt and drought stress signal transduction in plants. Annu Rev Plant Biol 53: 247-273.